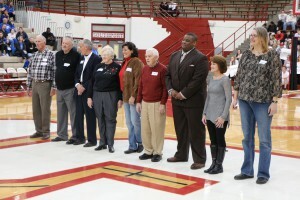 Six of Southport High Schools 12 Indiana Basketball All-Stars attended ceremony at Southport Friday night where a banner bearing heir names had been hoisted to the rafters of the historic field house. The four men and two women played on Cardinal Teams from 1962 to 1993. Southport’s first All-Star dates back to 1939. Following the ceremony the All-Stars signed autographs and reminisced with fans on the upper level of the. Hall of Fame coaches Marilyn Ramsey and Bill Springer were also there supporting their former players. for returning to Southport where your names along with your fellow all-stars will live on for decades to come. To see several pictures of the event log onto the Perry Township Schools Facebook page.